Minneapolis, MN – The YMCA of the Greater Twin Cities, a leading nonprofit dedicated to strengthening communities through youth development, healthy living and social responsibility, will host an all-city flag football tournament on Saturday, October 7 and a free basketball clinic at locations across the metro on Sunday, October 8. 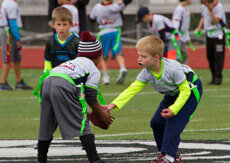 Forty-two teams with players in grades 2 – 8 will compete in an all-city flag football tournament at Roseville High School on Saturday, October 7. The public is welcome to attend, and concessions will be available. Free basketball clinics for kids ages 4 and up will be held at YMCAs across the Twin Cities. Participants will learn the basic skills of basketball from trained YMCA staff and can register for upcoming classes or leagues. No prior registration is required to attend. YMCA sports provide opportunities for kids of all ages and abilities to build confidence and learn new skills in a welcoming, fun environment. Learn more at ymcamn.org/kid__teen_activities/sports. Saturday, October 7 from 9:00 a.m. – 5:00 p.m.
Sunday, October 8 from 2:00 p.m. – 4:00 p.m.